1. I'm either a genius for thinking of this, or an idiot for not doing this earlier (I did a little math at the end of this to make myself feel smarter, just in case I fall into the latter category): if you put the peanut butter on the outside of the heel piece of bread your kids will never know they are eating the heel. Add fluff to guarantee success. If I stick to this trick instead of throwing out the heels (or turning them into breadcrumbs, which is what i usually do) I will save myself about 3-4 loaves of bread a year. 2. There are PURPLE bell peppers. I had no idea. How cool is that? 2. Toss fresh green beans in olive oil to coat, add salt, pepper and garlic to taste. 3. Spread single layer of beans out onto pan (I used pamper chef stonewear) and place in the oven for 10 minutes. 4. Turn beans over and add almonds. Roast for 10 more minutes. 5. Flip beans again and add cheese. Leave in for 5 more minutes. Everything should be perfectly roasted and ready to enjoy! What did you learn in July? Despite Memorial day passing, which typically marks the beginning of summer festivities, Spring seems to be lingering on around here. I don't mind because I have a boy who is drawn to water like a fish and he happens to have a cast on his leg at the moment. The chilly rainy weather we've been having gives us a good excuse to stay indoors where it's nice and dry, which is the ideal situation for a cast-clad boy. Along with the beautiful changes to our landscape and the sweet fragrances that fill the air, I am thrilled with the changes Spring brings to our table. Just as we pulled out the last bit of venison from the freezer, Cheyne started pulling trout out of the river. Fresh local greens are available at the markets and I keep thinking maybe this year I will be brave and harvest some dandelions. Maybe. But what to put in my coffee cup when the hot brew seems overdone and yet coconut iced latte is just too...summer? Lavender-Honey latte. Now, honestly, I have some guilt sharing this with you because it is the brainchild of the coffee gurus at the local coffee house I love and would visit every day if I had more subdued children and a budget that would allow it...but I don't. So I had to (yes, HAD to) discover an almost-as-good home version that would get me through these cool and rainy days when a trip to the coffee house isn't possible but the fragrant and earthy goodness of a lavender-honey latte is the only thing that will satisfy. Mix water and honey together in a sauce pan over medium heat until ll blended (do not boil). Let cool to room temperature. Add lavender essential oil. Store in glass container in fridge. 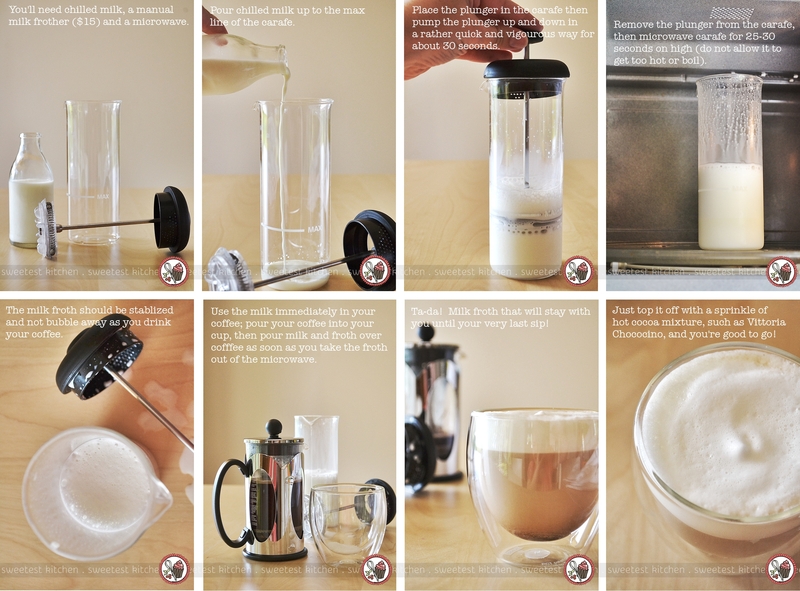 Add 2 teaspoons (or to taste) to 12 oz latte. It is delicious both hot and iced and it is surprising how the difference in temperature brings out different flavor notes. AeroPress method - it lacks the crema (the thin layer of foam on top of a traditionally brewed espresso), which is very unfortunate, but it works. We do it like this (she's a genius, I tell you), but we don't even have a frothing wand, so we use a baby food processor like this one. Use what you have. For iced lattes don't worry about frothing the milk, just add 6 oz cold milk to two shots of espresso. So what's been brewing at your place lately?